(Washington, DC) — Rep. Luis V. Gutierrez wrote Attorney General Eric Holder today calling for a federal task force to investigate and prosecute hate crimes occurring in Puerto Rico. Earlier in the week, the legislature in Puerto Rico began consideration of Senate bill 2021 to eliminate gender, national origin, and sexual orientation or identity as protected classes related to hate crimes under the Puerto Rico penal code (see Rep. Gutierrez’ previous statement from Dec. 5). The Congressman, who has been an outspoken critic of what he considers a broad spectrum of erosions of civil and human rights in Puerto Rico under the current government regime, is now asking AG Holder to get personally and directly involved. At least 18 LGBT individuals have been killed in Puerto Rico and a pattern of violence against women, transgendered, gay and lesbian people, and immigrants has been widely reported and was addressed in a landmark Department of Justice report on the systematic abuses of the constitutional rights of the Puerto Rican people by the police department of Puerto Rico. All Americans should be proud of the progress we have made in protecting all communities from hate crimes. We should be gratified that the trend in many states in our union is toward equal protection under the law without regard to sexual orientation, gender identity, gender, and ethnic origin. I am greatly disappointed that the ruling party in Puerto Rico is taking active steps to deny justice and equality to all of its residents. I hope that the U.S. Department of Justice will take all possible steps to help protect all of the people of Puerto Rico. Congressman Luis Gutiérrez (D-Illinois) has clearly become the voice of all things Puerto Rican. This week, on the floor on Congress, Gutiérrez reveals facts about how the Archbishop of Puerto Rico was the latest scapegoat of the the current administration of pro-statehood and Republican Governor Luis Fortuño. Gutiérrez speaks about how the current Puerto Rican government was attempting to silence the Archbishop about his views about Puerto Rico’s political status. The political paradox that is Puerto Rico continues to thrive on the island after reaction to pro-statehood and Republican Governor Luis Fortuño has been lukewarm at best. While the island faces some of the largest unemployment figures in its history, accusations of police abuse from the Department of Justice, charges of Social Security fraud, and angry reactions to spiraling electric bills, last week Fortuño tried to shift the political debate by turning to a topic that has haunted the island for decades: a final decision on its political status. It appears that the gamble has done nothing to help the Governor’s growing unpopularity. Fortuño is facing a reelection bid in 2012. First, there is the speech he made last week in response to President Obama’s surprising remarks that the United States would only support Puerto Rico’s right to self-determination if the plebiscites being proposed showed an overwhelming support for a specific status option. Historically, Puerto Ricans have been evenly split between their current commonwealth status and statehood. Fortuño, whose New Progressive Party supports statehood, said he will present legislation on Wednesday that would allow islanders to vote on Aug. 12, 2012 whether they want a change in status. If they want a change, voters would choose one of three options in a second referendum to be held during the November 2012 general elections. The three options would be statehood, independence, or a sovereign free association, which differs from the current commonwealth status. The chairman of the Popular Democratic Party said Wednesday that Fortuño’s announcement of a referendum was an attempt to distract the public from Puerto Rico’s current ills. The governor’s proposal shows how divorced he is from the reality of Puerto Ricans struggling to cope with a surge in violent crime, 16 percent unemployment and a crisis in the public health system, Alejandro Garcia Padilla said. He declined to comment on the concept of Sovereign Free Association, which appears to be closest to his party’s traditional stance in favor of enhanced commonwealth status. It appears that nothing has been gained so far from Fortuño’s intentions to push the status question back onto the radar, and as a result, the island’s tradition of typical partisanship, accusations, and criticisms continues. Puerto Ricans are also savvy enough to understand that the current political system and its future is still controlled by the US Congress and no one else. Maybe the idea of a bolder move will gain more traction? In the meantime, Fortuño announced today that he would push for a 15% to 20% reduction in Puerto Ricans’ electric bills over the course of the next 4-6 months, proving once again, that when times are tough, people are worried about paying their bills, not about their political status. 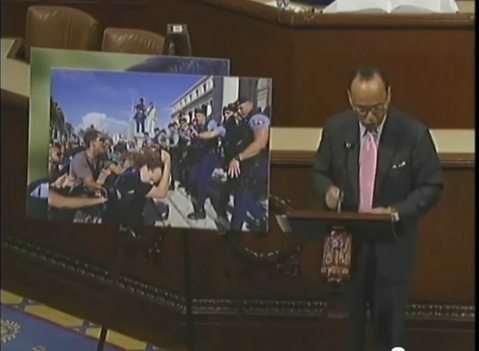 Leave it to Representative Luis Gutiérrez to leave it all out on the floor of the US Congress this week, in light of a scathing Department of Justice report on the police abuse charges in Puerto Rico. Gutiérrez, who has been the lone voice of Congress in exposing the hypocrisy of the pro-statehood Republican administration of Luis Fortuño, share his thoughts with his Congressional colleagues.